This is a curation project for science class about genetics. Anyways, genetics are interesting and fun to learn about! 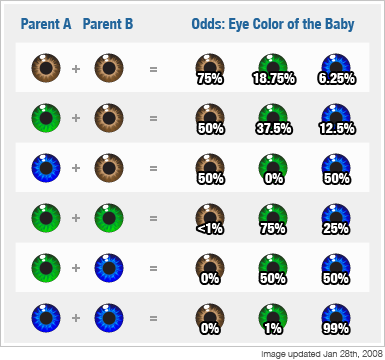 This chart shows how eye color genes work. This also gives an example of a genetic chart. This is important to my collection because it's important to know how to read a genetic chart. The Genetic Basics: What Are Genes and What Do They Do? This taught me what genetics do. It also taught me the basics of genetics. This is important because you must know what a chromosome is. This article taught me about the same things as the slideshow but in detail. It also taught me where the word genetics came from! It's important to know the details about things. This taught me why and how identical twins are different. It also gave me more of an insight on how genetics affect things. This is important because of how the smallest of things can change who you are as a person.